View of a DJ Software Program. 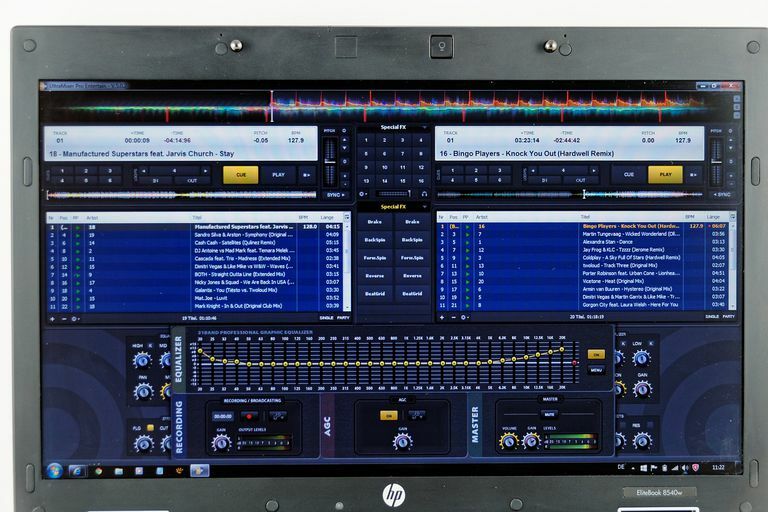 In its simplest form, a DJ software program (or app) allows you to take individual music tracks and combine them to create a new (remixed) track. Essentially this type of music making software emulates the 'old-style' way that DJs used in the past to remix tracks -- that is, a physical DJ mixing deck and vinyl records. However, with the dawn of the digital age, you can now do this with a computer, or even a portable device like your phone (via an app). And, this virtual way of mixing music has a lot more possibilities too compared to the 'old-school' way. Can I Use my Digital Music Library to Create Remixes? Yes, you can. If you're just starting out experimenting with remixing, then one of the main benefits is being able to use the songs already in your collection. DJ software can instantly open up a whole new world without you having to buy music/sound packs just to get started. Most DJ software has direct support for loading songs from an iTunes music library for example. However, as long as the songs are in an audio format that the DJ software application can handle, then you'll be able to use them regardless of what jukebox software you use. You can create your own remixes for free, or even whole playlists if you're feeling really creative. What Features Does a Typical DJ App Have? Virtual turntables -- these can be moved forwards and backward like real records to add scratching effects, etc. Controls for EQ and gain -- this is used for shaping sound by tweaking settings such as bass, mid frequencies, and the highs. The gain feature is for balancing the audio output between each of the decks and sometimes external hardware. Crossfaders -- essential sliding controls for mixing between sources. Transport controls -- functions such as start, stop, cue, pitch, bpm, keylock, etc. Real-time effects -- a range of real-time effects can be layered on top of the playing music in order to create unique and atmospheric mixes. The above examples only scratch the surface on what a typical DJ software application can have. But, these are core features that are essential for great mixes nonetheless. Do I Need Any Hardware For Digital DJing? You don't necessarily need any hardware in combination with virtual DJ software. You can simply tap your finger on a phone screen or use a keyboard and mouse on a computer. However, a DJ hardware controller is a lot better, especially if you want to take your remixing to the next level. As you might expect, these special external hardware devices look very much like DJ turntables. And, they are often preferred by professional DJs due to the more familiar (and useful) interface. But, under the hood, they are of course entirely digital. MIDI control is used to communicate with the DJ software. Some hardware also supports something called, Vinyl Control. This enables you to interact with digital audio as though it was physically on a vinyl record. Do You Know How Layers Are Used in Animation and Graphics?